There’s a special dance roosters have when they’ve found a delectable treat. They’ll drop one wing and prance about in a tight circle, calling the ladies in. As the hens rush to eat up the juicy worm or grasshoppers or spilled corn or whatever yummy bit he’s found, the rooster will back off and let them have it all, gloating over his success. It was this same dance that I endeavored to capture in the punch needle tapestry “Mr. 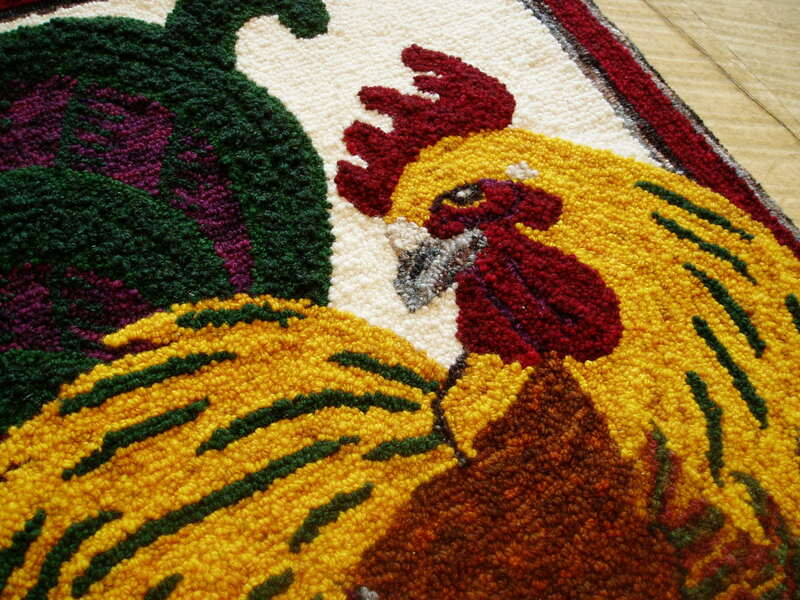 Rooster.” Made almost entirely with wool yarns from our sheep, the piece utilizes the Oxford punch needles “mini” and “mini with heels” to add three-dimensionality. 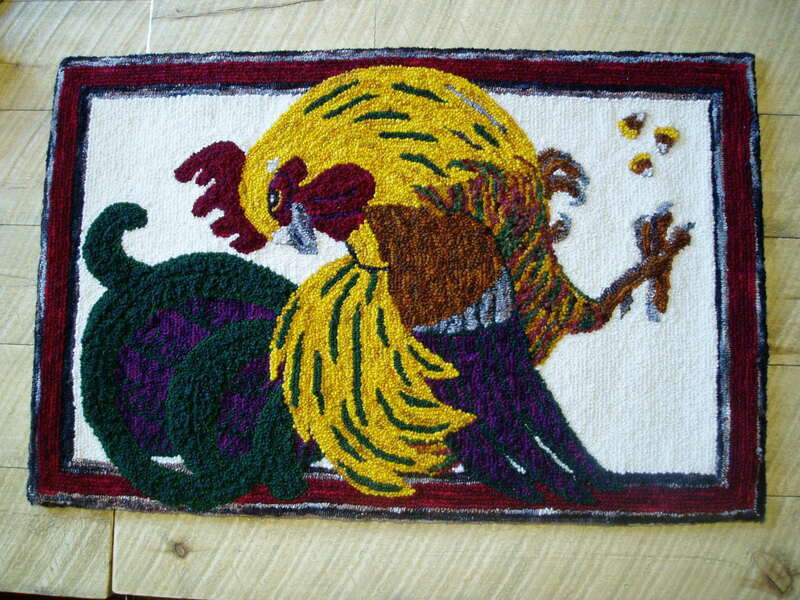 The variegation in the dyed yarns adds texture and the sense of layered feathers, while the background is the natural white of sheep, so as not to compete with the warm and cool tones of the rooster. Framed in barn red and wood tones, he’s leaping out of the piece–defying the frame with his jaunty stance. The face of any subject is always one of the hardest parts–it’s the element we focus on most (as the viewer) when deciding whether the character feels “right” or worthy of sympathetic emotion. With a rooster, the balance of wattles, comb, eye placement (and sheen,) and the shading and shaping of the beak and nose become critical in believability. I wanted the rooster to appear as though his face was closet to the viewer (therefore larger), which would also allow for the most detail within the constraints of the medium. Because punch needle rug hooking accommodates curves much more naturally than tapestry weaving, I wanted to bring out that sense of movement in his dance, the sweeping arc of his tail, and the flex of his wing. Feathers have a very rhythmic pattern to their placement on a bird (try plucking one sometime and notice the patterning of the follicles in the skin), and yet the bird itself is moving organically–twisting neck, lifting feet, flexing tail. Feathers overlap and shift across each other to accommodate this movement. All of this detail was worked while still using only wool! While Mr. Rooster does not have the sense of depth of some of my other pieces, it’s a charming study of the nature and character of a handsome rooster (and you know he knows it). Chickens have been close to my heart since I was 11 years old, so it’s not a wonder that they made their way into this medium. Hello Mr. Rooster. Welcome to my body of fiber arts work. Keep on dancing for those ladies out there who would love to eat that corn you found!